We applied Sickens stain and it is now peeling can I start by using your stripper and then what are the next steps ? Which Sikkens? Not all versions are strippable. I recently power washed a small redwood deck. It's stripped of all dirt and stains. Can I just apply brightener without using cleaner first before staining? Our redwood deck is 20 years old. It has been treated with Penofin. It is now gray and dirty. What are the steps we need to do so we can use TWP1500 on the wood? 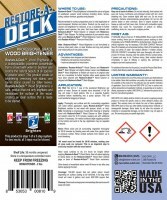 Will using the RetoreADeckCleaner prep the deck and the we apply the TWP1500? What should we purchase. Thanks. You would need to remove the Penofin with the Restore A Deck Stripper and Brighten after with the RAD Brightener. This will prep for the TWP. Looking at the TWP1500- can I use a garden sprayer to apply? What is the best application method? Yes it should remove the One Time stain. Always brighten after using the RAD Stripper. You apply with a pump sprayer but you do need to pressure wash off. I applied ONE TIME deck stain several years ago on approx. 1400 sq ft of deck. FYI: I DO NOT recommend this product. Will the stripper remove this product? I assume I should use the brightner after? I imagine I will need 2 of each for 1400 sq ft? I have a pressure washer but it sounds like applying this with a pump sprayer is better since it will be less diluted? Kathie, after sanding the wood you need to prep the deck with a cleaner and wood brightener. This will remove sand dust and "open" the wood pores so the stain is able to penetrate better. do not sand with a finer grit than the 60 paper. Kim T, which version of Sikkens? Is it the SRD or the Shiny Cetol version? I have sikens stain on my deck. Will it remove that? Kim T, yes you need to brightener to neutralize the caustic of the stripper. Your stain will look better and last longer! I am going to be staining our deck. It has stain on it that I want to remove. 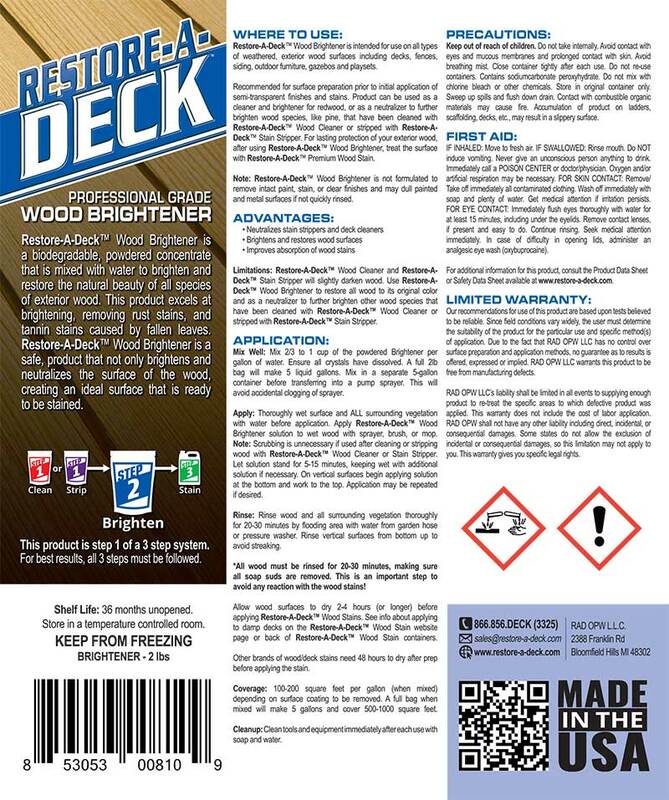 I am going to order the deck stripper, but if I am going to stain it again, do I need the wood brightener as well? The RAD brightener is applied with a garden sprayer. Let dwell for 15 minutes, than rinse off. Yes on the 100 Series or the 1500 Series. Nick P, it will be fine if you wait. I'm very happy to say that the RAD stripper worked like a charm! Took off the opaque "semi transparent" stain I never liked. I won't be able to use the brightener until next weekend. Will it hurt to wait a week or so to neutralize the stripper with brightener?